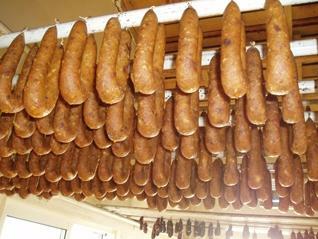 The Alheira de Mirandela is a traditional sausage made by the nice people of Trás-os-Montes. It is very popular and, unfortunately, many times mis-cooked. People from the south usually fry it and eat it with chips, like if it was a burger or a stake. Totally wrong! The Alheira is suposed to be grilled. You put it up on a grill and use a fork to make small holes in it, and it cooks within its own fat. Then you serve it with boiled potatoes and cabagge (like the Codfish on christmas) and olive oil, or you can serve it with beans and ripped cabbage soaked in olive oil. These are the genuine ways to eat an Alheira de Mirandela, don’t be fooled! This waltz its the fourth of my Portuguese suite for Toy Piano and it is dedicated to my granny Julia and my Aunt Maria Luísa, two Mirandela – São Salvador ladies that have been making delicious Alheiras all their lives. The musical score for this piece can be found here. Now, also, the live version played by me.